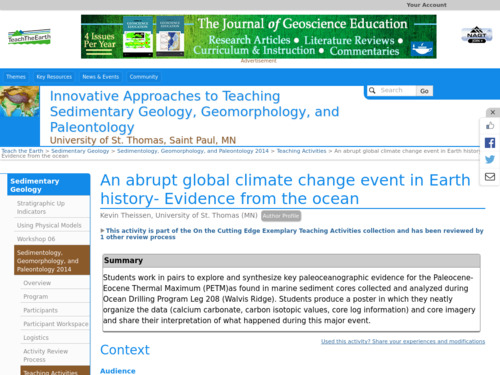 The Paleocene-Eocene Thermal Maximum (PETM) can be an engaging topic for students because it is an example of warming that is comparable to what we are experiencing today. The comparison of these two phases of warming can yield a fruitful exploration on the mechanics, rate, and impacts of climate change. Addressing the topic in this way can show the value of using paleoclimate to understand today's climate. Teaching tips are included in the activity overview. This is a capstone project in an intermediate-level college course and contains in-depth science and analysis. Students work with original data from marine sediment cores to interpret the paleoclimate during the the Paleocene-Eocene Thermal Maximum. This event (also called the PETM) is used as an analog to today's climate change because there was large-scale, rapid addition of CO2 to the atmosphere and significant atmospheric warming. Geochemical data for the PETM project date to 2005. Students compile and correlate data from five drilling sites in the South Atlantic Ocean. They examine the percentage of calcium carbonate, magnetic susceptibility, and carbon isotopes, along with core photos and the lithology from the core log. Using the information and techniques they have learned in class, they construct a paleoclimate history and create a professional-quality poster to display their results. This activity serves as a capstone project and sets high expectations for students. Students work in pairs or small groups and are expected to work through real data sets, which can be complex and tedious at times. This project also develops graphical analysis skills and students work with GeoMapApp, Adobe Photoshop, and Adobe Illustrator. Students could also use PowerPoint to make their posters, which is simpler to learn and use. A detailed assessment rubric is included. As this activity involves real data and a complex topic, significant support from the educator would likely be necessary. Activity provides helpful advice and insight for coaching students through the difficult parts of the process. Educator works closely with students at the beginning of the project to clarify expectations for project outcomes and poster creation, and to work with required software and datasets.